Villains are at the heart of every great adventure—scheming, plotting, and causing mayhem - but creating a convincing and detailed group of antagonists is no easy task. 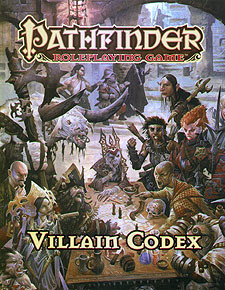 Pathfinder RPG Villain Codex serves up 20 groups of vile miscreants waiting to menace your player characters and foil their every plan. Inside this time-saving tome, you will find a wide variety of foes, from a scheming regal court to a sinister doomsday cult, ready to challenge characters of any level. These villains come equipped with a host of new rules elements to give them the edge against players and fit into nearly any campaign! Complete sections for 20 villainous organizations, including a power- hungry arcane society, a greedy merchant caravan, a fleet of scandalous pirates, a creepy secret society, and a wily thieves' guild. Trade blows with the serpentfolk-worshiping monks of Fang Monastery, match wits with the sly bandits of the Merry Outlaws, or defend civilization from the wild druids of Nature's Scourge! Information on each organization's history and structure, along with plot hooks to get the players interested in confronting the group. A wide variety of new stat blocks for all organization members, using each villain section's new rules.